If one major lesson can be drawn (as opposed to countless small and terrifying ones) from the last few years of populist upsurges, maybe it’s this: a consistent, well-sold policy—whether Bernie Sanders’ or Nigel Farage’s—can still resonate with dissatisfied voter blocs in a major way, wild-carding the amnesiac Central Casting burlesque that tends to be electoral politics in the quote-unquote Western World. Slick and meticulous, Fernando León de Aranoa’s Politics, Instruction Manual tracks the inside machinations of Spain’s Podemos party, an outgrowth of the anti-austerity 15th of May movement led by the ponytailed dynamo Pablo Iglesias, which was absorbed into the political process after a (mostly compensatory) challenge from the government establishment. 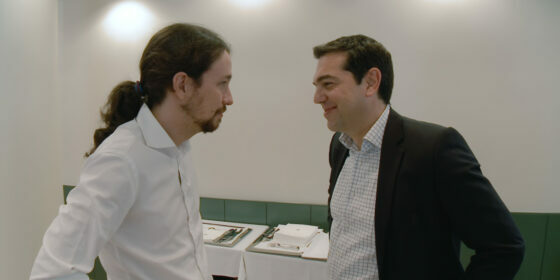 De Aranoa largely avoids the low-hanging fruit of demonizing Podemos’ right-wing opponents; the endeavour to transmogrify a groundswell of grassroots support into a viable, competitive platform leavens the film with enough paranoid tension for one campaign.